Catholics throughout the world are encouraged to honor the cloistered and monastic life on Pro Orantibus Day, which is Wednesday, Nov. 21, 2018. In observance of this special occasion, we ask all the members, friends and supporters of the Institute on Religious Life to pray for those who pray, especially any cloistered and monastic religious in your own diocese. Send a note to them expressing your appreciation! And consider publicizing Pro Orantibus Day in your parish bulletin or in other ways. Read more about your Loretto Carmelite Nuns HERE. 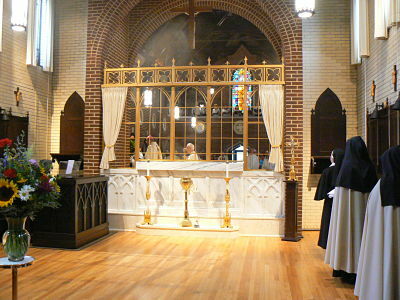 In 1953 Pope Pius XII instituted Pro Orantibus Day, also known as World Day of Cloistered life, to recognize those men and women who so generously give of themselves to this unique vocation and who each day, from the various convents and monasteries spread throughout the world, offer their prayers unceasingly to build up the Kingdom. Pope John Paul II later expanded its celebration and encouraged the faithful to support this special vocation in any way possible. As a sign of spiritual solidarity Pope Francis visited a Camaldolese monastery to celebrate vespers on Pro Orantibus Day. In his address the Holy Father stressed Our Lady’s great witness to hope, even in the face of difficulties and obstacles. 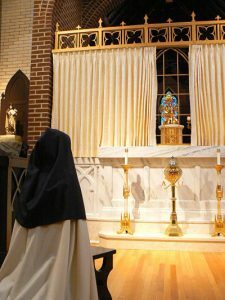 The Holy Father urged all cloistered nuns to keep the “lamp of hope” burning brightly, and that monastic religious must strive to conform their lives to the model of Our Blessed Mother. Read more about our Carmelite charism HERE. We praise and thank you for those sisters and brothers who have embraced the gift of the cloistered and monastic life. Their prayerful presence is indispensable to the Church’s life and mission, and is the foundation of the New Evangelization.